FINDING NEMO – NEW RIDE AT DISNEYLAND! 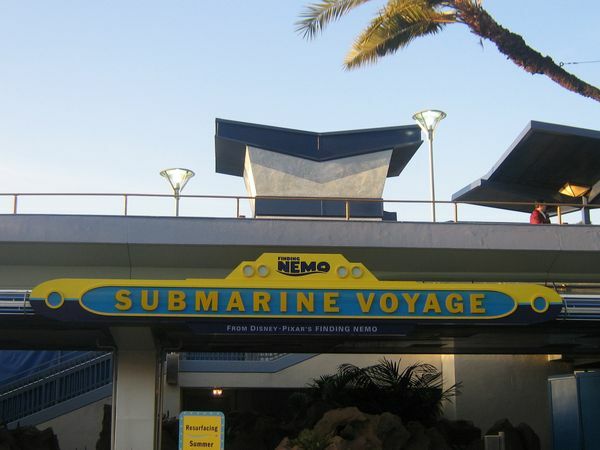 At the attractions entrance, guests enter the Nautical Exploration and Marine Observation (NEMO) research center. There are three seagulls perched on a nearby buoy, bellowing out the phrase “Mine! Mine! Mine!” every few seconds. 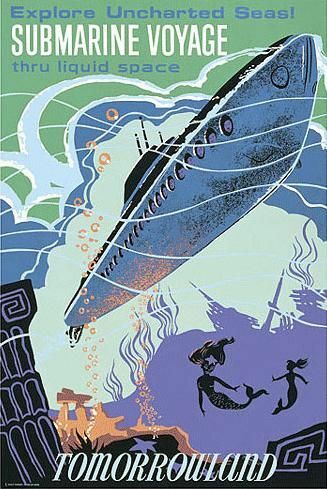 The guests board one of NEMO’s eight research submarines and set out in search of an active undersea volcano. Through their portholes, guests view a spectacular underwater environment. One of the first things guests see is Darla, the fish-killing niece of the dentist in Finding Nemo, freediving amid the coral, holding a bag with a fish in it. As we continue on, we see a giant sea bass swimming through the seaweed. The subs then enter the ruins of the ancient civilization of Easter Island, being explored by the dentist diver P. Sherman. Amongst the stone ruins lay gigantic tiki heads embedded in the sea floor. The scene soon changes as the subs are immersed in the setting of a coral reef in bright colors of orange, aqua, green, crimson, maize, and more. Monstrous clams slowly open and close as the subs pass. The captain commands the sub to dive deeper to avoid a surface storm ahead. Shortly after passing into the caverns, the guests can view moray eels snaking out of the coral at the sub as it passes, and lobsters pinching at the sub. The captain says due to amazing new marine technology called “sonar hydrophones, they can actually hear the fish talk. The subs then pass through a dark cavern where eels lunge towards the sub and lobsters are fighting. The subs pass Marlin and Dory as they discover Nemo has become lost once again. Further along the reef, the guests come across Mr. Ray and his class swimming through the coral looking for Nemo as well. The captain says they are approaching open water and the subs pass Crush, Squirt, and the other green sea turtles and enter the East Australian Current. The subs then exit the current and enter the Graveyard of Lost Ships where Marlin and Dory continue their search for Nemo. Bruce, Anchor, and Chum swim around a sunken war submarine surrounded by mines. The subs hit one, shaking the sub and causing it to temporarily lose power. The sub goes dark and Marlin and Dory are suddenly surrounded by small glowing dots. Suddenly a monstrous angler fish appears. After Marlin and Dory escape, they encounter a school of jellyfish. The submarine reaches the active underwater volcano. As lava flows down the edge of the volcano, the Tank Gang chant and Marlin finally finds Nemo. The volcano erupts just as the subs escape and enter the coral reef once again. The fish gather and celebrate finding Nemo once again. Suddenly, a pod of blue whales appear and one of them swallows Dory and the submarine. As Dory swims about trying to speak whale, the whale shoots the sub out through its blowhole. The sub captain tells the first mate and the passengers not to mention anything because nobody would probably believe them anyway”. He then says, “We better get out of here before we see a sea serpent or a mermaid.” (in reference to the prior attraction which featured mermaids and a sea serpent.) Soon after he says this, we see a coral formation shaped like the sea serpent’s head. The submarine then enters the harbor and view a pair of king crabs snapping at air bubbles atop a sewage pipe. The a song &Beyond the Sea (instrumental) plays as the captain thanks the passengers for riding. 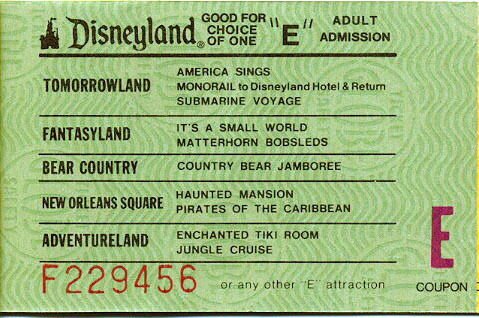 Early promotional image for the ride, some features appear different from this early artwork. 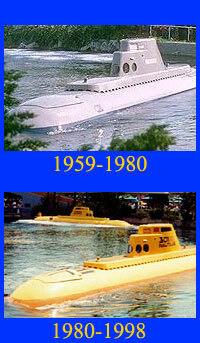 The attraction uses the same submarines used in the former Submarine Voyage. The load/unload areas are themed as an Australian Harbour, just like the movie. The ride’s submarines do not actually submerge; they are boats in which the passenger seating area is below the water level. The submarines hold 40 Guests each. The subs have been repainted a new flashy yellow above the water, with a light blue strip dividing a dark blue/black hull below the water. The diesel engines that powered the original subs have been replaced with a cleaner alternative that uses a non-polluting technology called Inductive Power Transfer. This innovation uses contactless induction technology to transfer power to the submarines under water, providing power to the new electric motors within the subs. Each submarine is painted with a wavy blue stripe across the ceiling. The interior also contains a dark blue color lining the portholes. Additionally, a new version of the ride, the observation station, has been provided for guests with physical disabilities who cannot navigate the submarine spiral staircases or who are claustrophobic. The observation station allows guests to experience the entire ride in high definition on a plasma screen.